After GDPR we know that we have lost some subscribers. If you are not receiving the Newsletter please e mail us until we can be sure that the link at the bottom of this page is working correctly. Exciting times in slacc tt as we join forces with The People’s cafe and Zero Waste Kendal. With this space for further developments. September is going to be a busy month. Check out the dates of various activities, many of which need volunteers. The pollination project is grant funded by The Ernest Cook Trust. e mail us at this address slaclimatechange@googlemail.com and let us know. We will send you the options available for joining. The AGM took place on 23rd March after an excellent presentation on Peak Oil by Ian Chapman. Attached below are the minutes of the meeting plus slides and references from Ian Chapman. Unfortunately the report is too large a file to be accepted on our website. I will look for ways of reducing it’s size. Have you heard of, or visited, Incredible Edible Todmorden? If so you will know how they have brought the town together to grow vegetables, fruit and herbs for all to share. They have formed a remarkable community group which encourages people to grow food and to understand the pleasures and benefits of growing fresh food. (). Here in Kendal South Lakes Action on Climate Change, which also manages our development as a Transition Town, (a town which actively looks for ways of moving towards a more sustainable, low carbon way of living which is more resilient to change) , experimented with some “edible planters” last year. Two at the entrance to Nobles Rest at the end of Maude Street, and one outside the Leisure Centre. Families, children and others are seen stopping to talk about, identify, look at and taste what is on offer. Last year they were planted and looked after by number of individuals . A variety of factors ,including illness, means that we now need new volunteers to help us take this initiative forward. There a range of levels of involvement from planting to maintaining, watering and keeping an eye on our planters over the next year. Who knows, with enough community help we could expand into developing an Incredible Edible Kendal. On 15th February the European Parliament has tabled the plenary vote for MEPs on CETA – the Comprehensive Economic and Trade Agreement between the EU and Canada. CETA still contains the climate-threatening ICS/ISDS text, which would give both Canadian and US oil and fracking firms the power to challenge and undermine any climate legislation that might reduce their future profits (such as any reinstatement of the Fuel Quality Directive’s distinction against higher carbon intensity fuels such as from Canada’s tar sands). Please write to your MEPs to vote against CETA because it undermines the Paris Agreement on climate change by giving such legal powers to fossil fuel and other TNCs. It protects the investor, but lacks any legal “teeth” to protect the environment. On the ICS/ISDS you could refer to this online pdf: ‘The strong case against separate corporate court systems (ICS/ISDS)’ which is reached with this link: www.bit.ly/ICSISDS This pdf states “We can’t let big US oil and fracking firms have an ICS/ISDS in CETA to undermine climate legislation.” and contains the quote: “Chevron argues that the mere existence of ISDS is important as it acts as a deterrent.” (EU Commission official about a meeting with Chevron on ISDS, 29th April 2014). And it’s not just the ICS/ISDS text that’s a threat: for example big business requests have been included in CETA text such as on “regulatory cooperation”, as this new report shows: https://corporateeurope.org/sites/default/files/attachments/ceo_regulatory_cooperation_06.1.pdf Also EU’s precautionary principle is diluted. The crucial “swing voters” (in a broad sense) on CETA will be the MEPs in the S&D group (Social & Democrat) – who call themselves “Progressives” and include UK’s Labour MEPs. Though UK public citizens and citizens-groups have persuaded most Labour MEPs such as Julie Ward MEP (NW England) against CETA, many S&D MEPs in other EU countries may follow their leaders by rubber-stamping CETA without adequate scrutiny – unless persuaded otherwise. 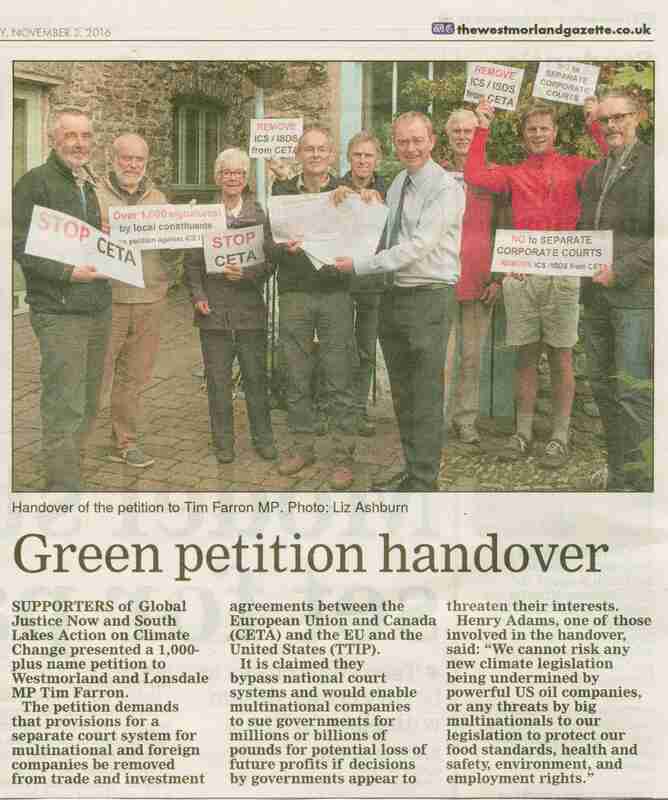 So please ask Labour MEPs to persuade their S&D allies against CETA. S&D MEPs are voting on S&D’s final position on Monday, 6th February – apparently the vote is on a knife-edge. You would think that the “progressives” would agree with the opinion against CETA by the MEPs’ Committee on Employment and Social Affairs: https://www.flickr.com/photos/henryadams/32497745535/in/datetaken-public/lightbox/ But many such “moderate” politicians seem to have a “herd” instinct and may presume an EU trade agreement with an ally to be a good thing, and there is a moo’d (excuse the pun) amongst many MEPs to rush through CETA before the EU loses another so-called “trade deal”. Below are both contact and source information to help you. GJN at www.globaljustice.org.uk and War on Want here: www.waronwant.org/final-ceta-vote-ask-your-mep-say-no both provide template emails which are quick and easy if you are short of time, but they don’t focus on climate change and won’t have the impact of your own personal email. No need to write much! www.dragonfly1.plus.com/ICS-ISDSpetitionin3nov16WestmorlandGazette.jpg – useful quote there? You could add e.g. “Please represent your constituents …” referring to number of signatures. Update on Canada’s tar sands industry re CETA: EU climate legislation in the Fuel Quality Directive has already been diluted to ineffectiveness when it was “traded away” like a “bargaining chip” during the negotiation of TTIP and CETA. The FQD’s climate legislation originally aimed to reduce incentives for importing the more carbon-intense oil products from sources such as the tar sands. Other limits to tar sands expansion via export have also been removed: Both Trump and Trudeau have OK’d the Keystone XL tar sands pipeline and Trudeau has OK’d other tar sands pipelines too, and the expansion of the tar sands industry, thereby making his signing of the Paris Agreement a pretence. The implementation of CETA and its ICS-ISDS would make it hard to halt expansion of the tar sands by regulatory means. More on the tar sands implications here: http://www.dragonfly1.plus.com/#blog for recent news, and www.dragonfly1.plus.com for tar sands intro. Slacc Membership To all those of you who currently pay by standing order. I now have a list of when your membership enters our account. I will be attempting the year to write to many of you before that event to ask if you would instead sign up for a direct debit through Local Giving. The advantage to us is that they will both match fund your membership this year AND claim gift aid if you sign the appropriate part in their application process. Here are the details, but I hope to send this to you during the year and a few weeks before your membership is currently paid. SLACC tt is keen to expand its support group for this project. We already have a small list of supporters and if you are on that list we will be contacting you later in January. In the meantime we know that once the project starts moving in March there will be a range of tasks best done by volunteers. Please contact us at slacc tt if you can help in any way. Takes range from monitoring to maintenance. Exciting times and much change to come as Slacc tt joins forces with The People’s Cafe and Zero Waste Kendal.